Suddenly this week both my computers decided to give me some grief. First was my Mac that is running low on disk space (it's all those pictures that I keep taking and filling my hard disk). It's interesting that when I'm below 8 GB of hard disk free things can get quite weird. Part of it is because I have 8 GB of RAM on my computer and that creates 8 GB of swap/restore space. And that space is not always taken, so at some point I could have 5 GB free and a few minutes later I only have 44 MB free. At that time is when all software in the computer freezes and I have to drop to terminal to do anything. Solution: free more space (which is not straight-forward, but I'm trying). Then comes to my windows machine... As I mentioned before, I have a Windows 8 machine that has been working reasonably well. Then Windows 8.1 came out and I thought: well, I heard good things about this upgrade, so maybe I should do it. 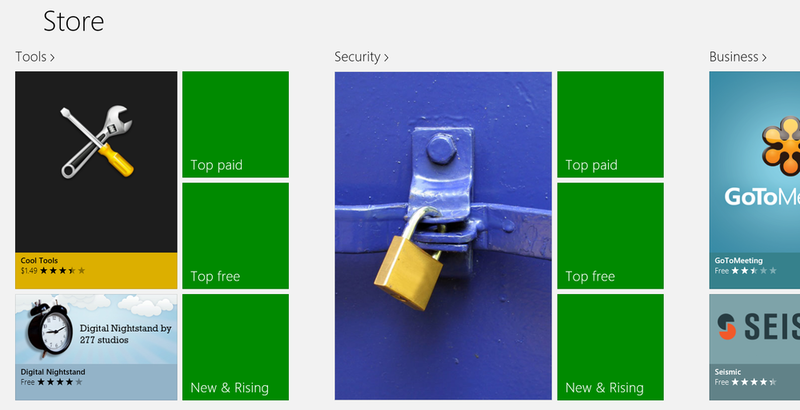 Oh, if only Microsoft agreed with me! I download it and start installing. After it reboots I get a very quick blue screen with a sad face and after rebooting again I get an error after I log in saying that the upgrade failed and it rolled back to Windows 8 with a cryptic error code (0xC1900101-0x20017). There are lots of conflicting reports about what could be happening, but none of the solutions that I've heard (forcing install of all driver updates, running disabling the network) worked for me. I did try to find the log and look for information on what is going on, but I couldn't find anything useful yet. Very frustrating! I'll report again if I'm able to upgrade Windows one of these days. As for my Mac, maybe it's a sign that I should upgrade my now 4.5-year-old laptop... New MacBook Pros have just been released, so it's a great time to upgrade..
Today I decided to take the day off and skip town with Amy. After some debating of where to go, considering that we have an event to attend tonight in Downtown Seattle, we decided to go to La Conner. A nice small town about an hour North of Seattle. It was a beautiful day (probably one of the last ones this year). Apparently lots of people are Gluten Free out there, so quite a few places we went to had Gluten Free things for Amy. And we ended up going to a bakery run by Trever McGhee, who currently has the Guinness World Record of the longest firewalk. And he owns a bakery and is "specialized" in making scones (and donating part of his profit to different charity organizations - today was the Boys & Girls Club). Very interesting person, but I guess that's required if part of what you do is walking on hot coals, huh? Anyway, didn't take many pictures there. For some reason I didn't quite find many picture-worthy things. 9 years at Amazon, huh? Adding semantics to how products are defined at Amazon, supporting easier category expansion. There were lots of other things that I've worked on. But these were probably the ones that had the biggest longer term business impact (even though the HTML5 app project was canceled not long after I left it - but it planted a seed onto different systems that hopefully will continue making Kindle products more innovative). So, yes, I have been in Brazil. A long time ago! And I barely met anybody besides my family. At least that part was successful. I had a good time hanging out with my sister and my niece and nephew. Then I came back missing my friends more than when I left. But I guess that's how it works. I just need to figure out how to go back more often than once every 3+ years. Work on a replacement alarm clock for the bedroom: I'm very frustrated by not being able to find an alarm clock that has all the features that I want, so I decided to build one. And, yes, I still have a wife with her projects, like her Turkorah . It's been quite busy in our household. I don't really expect to take too many pictures in Brazil, though, as it's mostly going to be around hanging out with family. Things are quite chaotic at work and I'm actually glad that I was able to take two weeks off (mostly because I planned this before things got this chaotic). And part of these two weeks is going to be Rosh Hashanah, which also limits the amount of time I'll have to hang out with friends. But hopefully I'll be able to do some if it too. What I probably won't be able to do is to be a tourist. Oh, well... Next time! Brazilians consume about 4,460 mg of salt a day, Americans consume 3,400 mg. The recommended is between 1,500 and 2,300 mg a day. Hey, you: hands off the keyboard and step away from the computer! Who in their right mind (or otherwise) would decide to add a username and password to a database in the error message??? I see this blog is becoming a place where I paste problems I see on other people's work. I'm sorry about that. I still do my work too! I can't talk about what I do at my "day job" but I'll eventually show some of the things that I've been doing on weekends. I just need to have a little bit more time on weekends to finish things, so that I can talk about them. Hang in there! From time to time I look at Google+ for a reason or another just to see if there is any interesting reason to use it. But every time I do that I find things that just make no sense. For instance, twice already I had Amy on my circles and suddenly she wasn't on any circles anymore and Google+ was suggesting me to add her to circles. Huh? And I had to explain to my wife TWICE that it's not that I removed her from my circles. Fortunately she doesn't use Google+ so it wasn't a big deal. What you can't really see here is that if you choose "None of the above" it will make "enterprise" grayed out and unselect it if you had selected it. 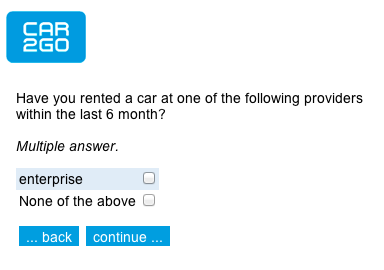 So, yes, it uses checkboxes to allow for multiple answers, but semantically it really only allows one answer right now (I think somebody was lazy and forgot to fill the list of the major car rental companies there). And the first thing that came to mind is: oh, Mountain Dew is not a breakfast drink? I don't drink it, but I've met multiple people that drink Mountain Dew all day long, including breakfast. So I'm not really sure how much market they will be able to get here. Maybe it's just that they can charge more and make more money out of the people that will switch just because PepsiCo now says that this one is "good to drink in the morning", so it must be healthy? It has juice (5 percent of it!) and vitamins! And, who knows, it might not have neon green color! Anyway, thinking back on it, if people that drink Mountain Dew for breakfast change it to drinking this Kickstart, maybe they will be better off. It might have less chemicals, and some small nutritional value. It will have the same amount of caffeine (5.75 mg/oz), which could make people not drink more of it. So, go PepsiCo! Normally on Tuesdays I have voice lesson. However, yesterday it ended up being cancelled because my teacher had an urgent matter to deal with. Well, so I decided to use the evening to instead of just working late (which is not that I don't have to do, as I still have a ton of performance reviews to write) to go to a concert: Eighth Blackbird. It was quite great! Nothing like come contemporary classical music to make your day more interesting! As you can see, they are all pretty recent (almost all of them composed when I was already alive, which is quite unusual for classical music). The weirdest one was probably Tom Johnson's Counting Duets. Unfortunately I can't find any recordings for you to look at, but basically it's for two musicians that just move around the stage counting (like "1", "2", "3"...). Just fascinating! Anyway, they are nominated again for a Grammy. They already have two! I can't necessarily claim that I understand the correlation between quality and being nominated to a Grammy, or even winning one in classical music, but at least it means that they have some following and some people that are investing money on them to get them into the Grammy's. And I think it's well invested! This was on a Dell ad that I saw when reading an article on Slate. This annoyed me so much that I can't even remember what the article was about! Is my HTML experience ruined? When I joined Amazon, working in the catalog world, it made my life shopping at Amazon hard. I'd see all the possible catalog mistakes and it's would drive me crazy. Less broken, but still not optimal. I tried to look at the markup itself and it seems to be some very strange unicode character that is causing it. Oddly, when I look at the inspector things look much more like what it looks on Firefox. I don't know what is causing Chrome to rotate those dots and then get confused about the text width and not know how to build that div. Fascinating... The font issue is the same, but it can figure out the right size for that div! Ah, HTML... 3 browsers, 3 different results! Amazon launched AutoRip, which provides you with automatic MP3 versions of albums that you bought in CD form from Amazon. Not all CDs work, but for the ones that work, it will make things a little easier. Doesn't sound very exciting, right? Well, I went to check today what CDs were auto-ripped for me (well, all my CDs are already in MP3 format, so I was wondering what would happen with those) and it added 4 CDs to my collection. All 4 actually were CDs that I bought for other people! Thanks, Amazon (well, maybe I should thank them more if I really wanted those songs...)! On January 14th I start in a new team at Amazon working on yet another secret project. My two years at Kindle were amazing. I learned a lot of what it means to do device and HTML5 development and handle working with a lot of people that are not on the same city I'm in. I've worked with some great people that can handle change in direction, or sometimes staying on the same direction for a long time, and still be fun and hang out from time to time. End-of-march-ish my younger sister will become a mother of my first nephew (I have a niece). So that means I'll be heading to Brazil at some point during the year, but I don't know when yet. More friends locally are going through the transition of becoming parents, which is also interesting. After singing bass/baritone for about 16 years, I was now moved to being a tenor 2, and it's working alright so far. I finally went to Victoria, BC, Canada. Let 2013 come and bring joy to us all! There are lots of examples out there of systems not knowing how to count. I know that I have problems from time to time with Google Reader of it misrepresenting how many unread articles I have, for example. But today I found something that is closer to my control: Amazon Instant Video. And yes, you are not crazy: there are only 16 of them. How fascinating! It's so easy to get this one right! The code is pretty simple: it uses a couple of libraries that already were provided out there (will provide the links soon, and post my modified code) and basically reads the two values and sends them to a receiver that is connected to my computer and logs the results. Seems simple, right? Well, it is! So I put the sensor on the guest bedroom and I'm reading the information from my "lab" and it says: Temperature: 13ºC, Humidity: 27%. According to my measurements with other sensors, it should really say something like Temperature: 17ºC, Humidity: 52%! The interesting thing is that I have 2 of those sensors (they were $4 each) and they all say exactly the same thing, so if it's a calibration issue, it's consistent. I'm not sure of what my theory should be. At first I thought that maybe humidity sensor was shifted by a bit and actually it's double that (which is consistent), but then the checksum should fail and the temperature should be off by a factor of 2 also, which it isn't. What's next, then? Fortunately I have another humidity sensor: HH10D. A little more expensive and way more awkward to use (you have to read the calibration values from an EEPROM and then read the data and use those values to calculate the values), so I guess I'll leave this for some other time - probably next year (I don't know if I'll have time this weekend and then my parents will be in town for two weeks). Oh, well. We keep at it! Sometimes odd things can hide "treasures"